Horses' manes are traditionally braided for competition and for taking part in parades. The historical reason for this is that it shows off the shape and muscle of the horse's neck and allows its conformation to be seen clearly. Different breeds of horse and different types of event require specific types of mane decoration. For example, show jumping and showing competitions require the mane to be braided into a number of small braids along the ridge of the neck to show off the neck. Comb the mane through, then divide it into an odd number of sections, each one the width of the comb. Secure with a plaiting band. Standing on a step if necessary, start nearest the horse's ears, remove the first band and wrap it round your finger out of the way. Plait the first section of mane using a three-strand braid, keeping the tension firm and even. Use the plaiting band to wrap the end of the plait. Work along the mane, braiding the other sections in the same way. Cut a length of thread and thread the needle. Starting with the first braid again, put two stitches in the end of the braid to hold the thread, then push the needle through the base of the braid. The braid will double up on itself. Fold it in half again so that it makes a small roll at the base of the horse's neck, and sew it into place with a stitch on either wide. Do not wrap the thread around the braid as this will spoil the shape. Roll and stitch the other braids in the same way. Decorate each braid if required with a small bow of thin ribbon. This look is not suitable for competitions as it distracts from the horse's neck, but is bright and colorful for a parade horse. Comb the mane out thoroughly. For Arabians and Welsh ponies, the majority of the mane is left free with a small braid just behind the ears. This is designed to hold the mane away from the head and show off the shape of the head. Separate out a small section of mane just behind the ears and braid using a three-strand braid. Secure with a plaiting band. It is also permissible to include a colored ribbon in the braid and to use this to secure the end with a bow. Create a running braid. This is suitable for heavy horses such as Shires, and it helps hold a mane out of the way on a hot day. Comb the mane out thoroughly, and start by the ears. Separate out three strands of hair, and start to braid by making one turn of each strand. Move slightly down the neck and pick up the next strand. Incorporate it into the bottom braid. Braid another turn normally, then add in the next strand so that the braid grows along the ridge of the neck. To make a good look for a parade horse, braid in a colored ribbon and use it to tie the end of the braid. Create a Spanish braid. This is similar to a running braid, but instead of running along the top of the neck it runs down the side. This is often used on Spanish breeds such as the Andalusian and is designed to enhance the line of the neck. Start by the horse's ears, and take three strands of mane. Begin to make a normal three-strand braid. As you lift the third strand into position, add more hair in. Continue to add hair into the left strand only, and the braid will start to grow about 3 to 4 inches from the top of the mane. Continue to work down the neck, and when you reach the bottom, finish by braiding the loose hair into a pigtail and securing with a band. Comb out the mane and divide it into sections a comb's width across. Starting by the ears, braid the first section and secure with a band. Continue down the neck, braiding each section in the same way. Take the first braid and hold it by the end. Loop it back along the neck and secure it to the base of the third braid using a band. Go back up the neck and take the second braid. Secure this one to the base of the fourth braid. Continue to work down the neck in this manner until all the braids are looped up. Leave the last one loose. Take flowers, bows or rosettes and tie over the base of the braids to hide the bands. Tie a ribbon to the end of the last loose plait. For extra color, braid different-colored ribbons into each braid and use the ends of these to attach the ornaments. 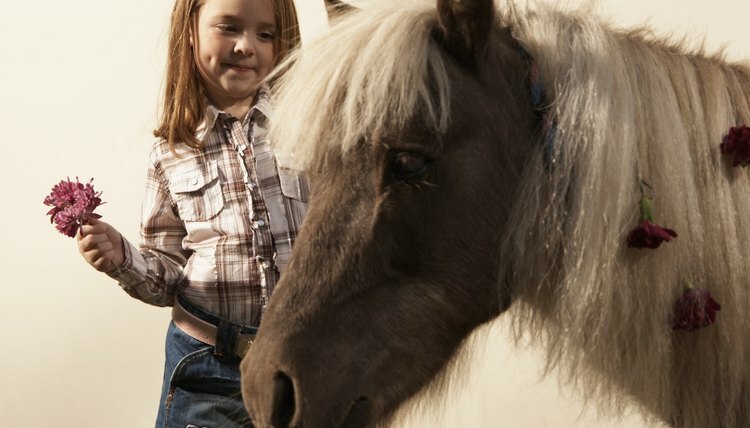 Wash a horse's mane about a week before you want to plait it. If you wash it on the same day, it will be too slippery to plait. When decorating a horse's mane, take care not to use any decorations that will flap and frighten the horse or dig into it.